You'll need to register for this service please email or write to us with your request and include a supporting letter from your doctor or surgery. When we've received the request we'll write to confirm you can start making bookings. When is clinical waste collected? Clinical waste is collected on a Tuesday. 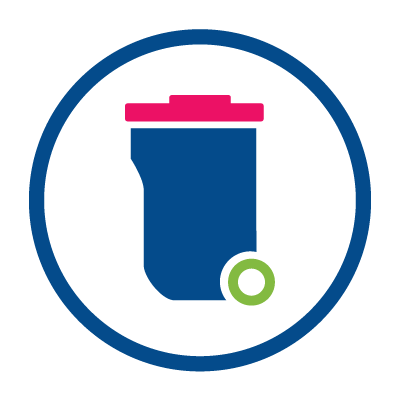 Who can book a clinical waste collection? It's only available to residents who've registered for the service. Nursing homes, hospitals, doctor surgeries and clinics should make arrangements with their waste contractor. We can’t supply the sharps box, but you can get one from your doctor or a pharmacy. Incontinence pads and nappies don’t need a special collection as these can go in your black wheelie bin. You get two free collections a year. After that they cost £5 per booking. There are two ways to book a collection. You can either book a collection using our online form or by calling 01622 602600. Please leave what you want collected by your front door for 7am on the day of collection. Sharps boxes should be left out on their own and not in the orange sacks. Other clinical waste should be left out in the orange sacks provided. Do you need help putting your bin out? If you are elderly, disabled and live alone and need help putting your rubbish and recycling out call 01622 602600. In addition to your rubbish and recycling, we now collect small electrical items and textiles. Small electrical items will be collected on your rubbish collection day. The items should fit into a carrier bag and put next to your black rubbish bin. We can't accept televisions, computer monitors or any items that won't fit into a standard sized carrier bag. Textiles are collected on your recycling collection day. Again these should fit into a carrier bag and put next to your green recycling bin. We can't accept pillows or duvets or any items in black sacks or charity bags. Batteries will be collected on your rubbish collection day. They should be placed in a sandwich bag on the closed lid of your bin. Unfortunately we can't accept car batteries.